Dialup Password Recovery provides an easy way to recover lost password of your Dialup Internet connection or VPN connection. The program displays (recovers) logins and passwords for LAN, Internet and network access (including modem connections, ISDN lines, virtual private networks), and works with Windows 7, Vista, 2008, XP, 2003, NT, 2000, 98. Try it now for an instant password recovery. Full install/uninstall support. Recover forgotten Dialup, RAS and VPN passwords. 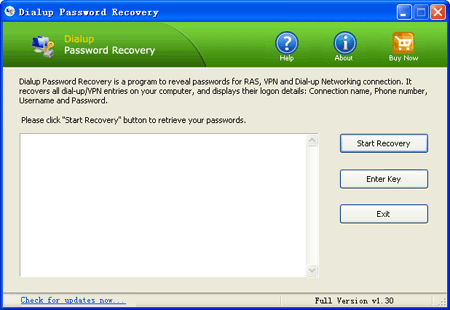 Recover lost dial-up, RAS, ADSL and VPN passwords in Windows 7, Vista, 2008, XP, 2003, 2000. When you set up RAS, VPN or Dial-up Networking connection, the operating system will give you the option to store the password. Although the password is constantly stored in your computer, the operating system doesn't allow you to watch it. What happens when these passwords get forgotten or lost? If you forget your password, you can use the Dialup Password Recovery for recovering your passwords. Dialup Password Recovery enumerates all dialup and VPN entries on your computer, and displays its logon details, such as User Name, Password, Phone Number, and Domain. "With this program, I get back my dial up password, then create a new dial-up connection and enter the password, I can surf the Internet again! Thanks a lot! It save me lots of time!" "I would advise everyone to get this valuable tool to get back their lost password. This is a fantastic tool for the price you are charging, and the updates you get for FREE are a real blessing!" Learn How to recover forgotten Dial-up passwords with Dialup Password Recovery.